Lola Cars International Ltd has just announced a development programme for its LMP2 car. Lola’s Phil Tiller is heading up a wind tunnel programme to increase the car’s downforce, while a new body kit will reduce weight. Mechanical changes will result from work on Lola’s seven-post test rig, while the gearbox is also coming in for scrutiny. The B05/40 was the first of the new LMP2 chassis, and took championship titles in its first year - in the Le Mans Series (Chamberlain-Synergy) and the ALMS (Intersport) in 2005. Intersport still just about leads the LMP2 points in the ALMS, and while the Lola has had consecutive wins at Le Mans (RML) and a run of wins in the Le Mans Series, the opposition is gathering, notably in the form of the Radical SR9, the (much more expensive) Porsche RS Spyder and next year’s Acura-powered Courage chassis. "We have embarked upon a programme that will ensure that this package will continue to dominate races and championships in the second part of this decade," confirmed Lola Group Chairman Martin Birrane. “We are committed to continued race and championship wins. Our existing and our future customers will continue to enjoy performance and reliability that will ensure that we still keep ahead of the competition." 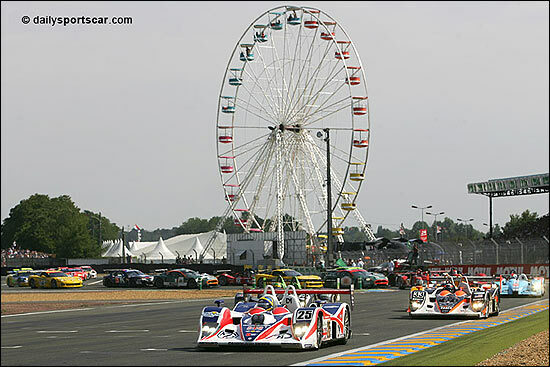 This was the scene at the start of this year's Le Mans 24 Hours.